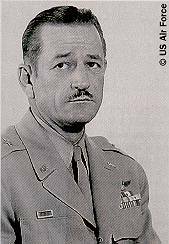 The Pacific War Online Encyclopedia: Ramey, Roger M.
Roger Ramey aspired to medicine but was persuaded by his National Guard captain to take the competitive examination for the Military Academy at West Point. He rose rapidly through the ranks after war broke out in the Pacific, and directed the devastating raids against Wewak. He then commanded Superfortress formations in the strategic bombing of Japan. Postwar Ramey directed the ABLE shot during the Operation Crossroads nuclear tests. However, he gained unwanted notoriety over the Roswell Incident, which UFO theorists claim was a crashed flying saucer but the Air Force maintains were remnants of a top secret balloon program. Ramey was remembered by fellow officers as a brilliant leader with a colorful sense of humor.